Buns in my Oven has come up with the most delicious breakfast recipe there is! The only thing I see wrong with this recipe is that it needs MORE BACON! 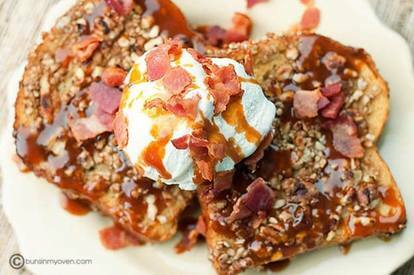 Salty meets sweet and melts together with savory Bacon to start your day out perfectly! Ok, so it doesn't necessarily HAVE to be for breakfast. But, who said you can't have ice cream with breakfast anyways?